Tuesday nighter’s are awesome, but they are a condensed version of a full-on weekend ABA race. On Tuesdays, the courses are normally only around 1.5km per lap, and due to the failing light here in the fall, the number of laps are less as well. In ‘b’ group, the races last about 25-30mins. Even still, last week I finished my last lap in the dark. So this Saturday, I was watching the Elite Men struggle through a course that was not just twisty, hilly and devious, but also long because they were racing the full 1 hour race length and I had to try to stifle my own apprehension. Thankfully I knew my Sport category race on Sunday was only going to be 40mins. Still though, that’s another 10-15mins of all out max effort – not an easy task by any stretch. Sunday morning I showed up an hour early to ride the course, learn some lines, and get warmed up. 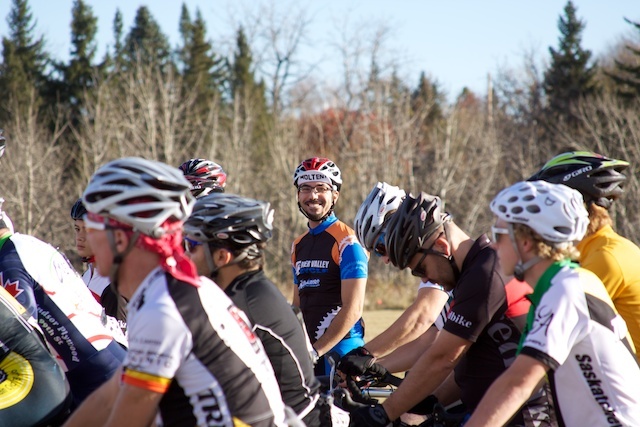 It was a sunny, but cool morning – perfect for cyclocross. I thought I felt pretty good despite another less-than-ideal night of sleep, maybe 5-6 hours (this is opposed to my target 9 hours). Ah the joys of parenthood, haha… Once the race started though, it only took me ¾ of the first lap to know that I just didn’t have it in the tank. I was right in with the guys I normally race with, but my exertion level to stay there was through the roof! Looking down at my heart rate, (yes I know, Gord… Don’t look at your heart rate in a race, haha) I was well outside my sustainable zones for a Tuesday nighter, never mind a longer race like this one. I had to ramp it back if I was going to finish, so sadly I dropped off from that pack, and settled into a groove I could hold. This was made doubly frustrating because I had a great cheering section there, with both my and my wife’s parents, my brother, and my wife and my boy (young Gavin). Even Ken and his wife Kerstin and their wee little gaffer, Campbell, were there. So with a cheering section like that, you want to put on a good show! Needless to say I felt a little bad that I wasn’t on form. Still, this was the first ABA cyclocross race where I didn’t come in at the very back of the pack, as was the case for my entire 2009 season. With another year of mtb racing under my belt, and a late season shift to some sprint and interval training I am faster this season. I’d also be negligent if I didn’t give a shout out to my bike though. Racing the with the right tool for the job makes a massive difference, and that Kona Major Jake from River Valley Cycle has been running flawlessly for me. It handles the twisty sections amazingly well, and it’s super light, so tossing it up on my shoulder for run-ups is no problem at all. I’m lovin’ it! Looking forward now, I’m going to try and keep the training up the next few weeks and have a strong finish to the CX season, but being a proud new papa, there is certainly no guarantee of anything. If nothing else, maybe I’ll really just hope for a little more sleep. A hearty ring of the cowbell to the ABA, Juventus and Red Bike for the great races this weekend. Good times!